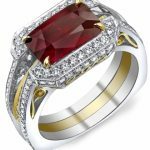 What is the June Birthstone? People who are born in June are actually lucky enough to have not one, but three stones associated with their birthdays. The June birthstones are: pearls, alexandrite’s & moonstones. Officially the world’s oldest gem, pearls are unique as they are not found deep under earth like most gemstones, but instead are created by living sea creatures, (mainly oysters). Because of this, the exact date that pearls were initially discovered is unknown. However, one of the first recordings of pearls was from 420 BC when a fragment of pearl was discovered in the tomb of a Persian Princess. Pearls were also used as part of decorations in 4th Century BC Egypt. Natural Pearls – these are pearls that grow naturally, inside either oysters or mussels. In the past all pearls were ‘natural’, but as time’s moved on pearls are extremely rare and expensive and are not generally available. Cultured Pearls– cultured pearls are created when humans introduce a foreign body or ‘nucleus’ into either an oyster, or mussel, which it then covers in ‘nacre’ or mother of pearl. 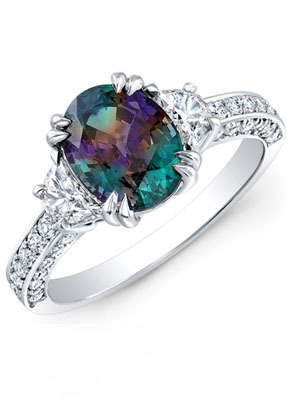 An Alexandrite is a rare gemstone that was first found near the Tokovaya River in Russia’s Ural Mountains in 1830. It was named after Tsar Alexander II as it was discovered on the day he came of age. Up until 1987 the gem was solely found in Russia until it was discovered in Hematita, Brazil. The colour is extraordinary due to the fact that it changes depending on the light that it’s in. In daylight the gemstone appears to be green, however in darker light the appearance changes and the stone becomes red. 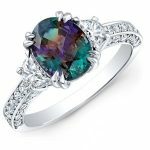 In mystic terms an Alexandrite is meant to bring creativity to the wearer as well as to strengthen their intuition and imagination. A moonstone was named by the Greek’s after its similarity to the moons silvery light. Its colour can range from being colourless, to a white, grey, brown, yellow, orange, green, or peach colour. A moonstone is also referred to as a ‘dream stone’, because of it is said to bring sweet dreams to its owner.